Since the late 1970s, the San Diego labor union work injury attorneys at DiMarco | Araujo | Montevideo have assisted injured union members who have been the victim of the full range of job injuries and work accidents. We will use our extensive experience to help you get the maximum compensation and benefits that are legally possible. Before making any decisions regarding the work related injury, you deserve to at least know your rights and your legal options before moving forward with a workers’ compensation, third party or personal injury claim. Workers’ compensation insurance could even pay for temporary disability, medical care, rehabilitation, permanent disability, part of your lost wages, and more if your injury and circumstances warrant such payments. Call our firm twenty-four hours a day at (619) 946-6466 to setup a free initial consultation. Many in San Diego have told us that we are the best San Diego work injury lawyers around and we work hard to continue to live up to those standards. Our complete injury law firm has the unique experience that is needed to properly and completely help employees who are a part of a union. One reason is that many of our lawyers have grown up in union families, we believe in the union cause and we have helped injured union members for over three decades with the full range of potential on-the-job accidents and work injuries from broken bones to amputations. We are reputable lawyers who go all out for their clients. The Better Business Bureau gave us an A+ for service and ethics and we’ve earned the trust of many unions. This includes the Orange County Employees Association as we are their exclusive injury representation. We understand the employment problems and labor issues that occur for union members. All of our attorneys and staff continue to educate themselves on the latest employment laws, workers’ compensation laws and labor laws to make sure that we are prepared to represent you after your job injury or workplace accident. We have experience representing job injuries and work accidents that occur to union members in all of the following unions, labor organizations, employee associations and more. Contact us at (619) 946-6466 if you have questions about your job injury, work accident, union benefits or how to file a workers’ compensation claim for your workplace injury. This union protects the rights of and bargains for the electrical workers throughout Southern California. IBEW Local 465 and IBEW Local 569 all represent electrical workers who work both indoors and outside throughout San Diego County. The DCAASD’s slogan is “Representing the Finest City’s Finest Attorneys since 2005.” Their website is http://dcaasd.org/. This association protects the firefighters in San Diego. It is a local of the IAFF (or International Association of Firefighters). Their website currently is http://www.sdfire.org. The SDEA ensures that teachers and educational conditions in San Diego are being watched and protected throughout all contract disputes, job accidents and work injuries. Their website is http://www.sdea.net/. The DSASD has been the “Strength Behind the Badge” for over five decades. Their website is http://www.dsasd.org/ and they serve over two thousand sworn deputies. The SDDAIA is a mutual benefit corporation. They represent their members in all matters of contracts, wages, conditions, and to promote the professionalization of peace officers. Their website is http://www.sddaia.org/. The SDPOL has been around since 1912 and it aids police officers in issues regarding injuries, wages, hours, working conditions and contracts. They also help the families of officers who are injured, sick or deceased. Their website is at http://www.sdpoa.org/. The goal of the SDMEA is to improve the conditions of their fellow city workers. Their website is www.sdmea.org. Given the vast number of machinists and aerospace workers in San Diego, this union is thriving. In fact, it is one of the biggest district lodges in the country. Their abbreviation is IAM and the San Diego office is District Lodge 725. This union continues to serve those in one of the most physically demanding jobs in America. The UDW’s local website for San Diego County is http://www.udwa.org/counties/san-diego/. They work to protect and promote domestic workers all throughout the county. They are also known as the Homecare Providers Union. Lifeguards are needed throughout San Diego County as community pools and beaches are common. Click here for the SDLA website. Located on the campus of UCSD, Local 9 serves its members throughout San Diego. Their website is http://www.upteucsd.org/. This important union works to protect public service workers. Their website is http://www.seiu221.org/. The Laborers’ International Union of North America Local #89 represent thousands of hard working people throughout all of San Diego County with their offices in the City of San Diego. This union is also known as the San Diego Bus Drivers Union. They protect the working conditions and contracts of bus drivers and try to prevent work related injuries for bus drivers. Located in San Diego, Local 29 protects people who work in some of the most dangerous fields in America. The SDCSPOA’s members are sworn to protect “the education of our future leaders.” Their website is http://www.sdcspoa.org/. The IATSE protects those people who are employed as theatrical stage workers in San Diego. Their website is http://www.iatse122.com/. Union Yes is the San Diego and Imperial Counties Labor Council. It is the local central body of the AFL-CIO and it includes over 129 affiliated labor groups. Their website can be found at http://www.unionyes.org/. The American Federation of Labor and Congress of Industrial Organizations is a voluntary federation of international and national labor unions. Some of the unions that are a part of the national AFL-CIO are the American Federation of Teachers (AFT), American Federation of School Administrators (AFSA), American Federation of Musicians (AFM), Air Line Pilots Association (ALPA), American Federation of State, County and Municipal Employees (AFSCME), American Postal Workers Union (APWU), California School Employee’s Association (CSEA), International Association of Machinists and Aerospace Workers (IAM), International Association of Fire Fighters, American Federation of Government Employees, Actor’s Equity Association (AEA), American Radio Association (APA), and Screen Actors Guild (SAG). Additional Unions within the AFL-CIO are Federation of Professional Athletes, Communication Workers of America (CWA), American Guild of Musical Artists (AGMA), American Guild of Variety Artists (AGVA), Association of Flight Attendants (AFA), Bakery, Confectionary, Tobacco Workers and Grain Millers International Union (BCTGM), National Association of Letter Carriers (NALC), United Automobile, Aerospace & Agricultural Implement Workers (UAW), Farm Labor Organizing Committee (FLOC), Laborer’s International Union of North America (IUNA), International Association of Heat and Frost Insulators and Allied Workers, National Nurses United (NNU), Amalgamated Transit Union (ATU), American Federation of Television and Radio Artists (AFTRA), and International Brotherhood of Boilers, Iron Ship Builders, Blacksmiths, Forgers, and Helpers (IBB). Each of these unions is important for protecting the rights, wages and benefits of workers in their particular field(s). The AFL-CIO’s list of unions continues with the International Federation of Professional and Technical Workers (IFPTE), National Postal Mail Handlers Union (NPMHU), International Union of Operating Engineers (IUOE), Sheet Metal Workers International Association (SMWIA), Transport Workers Union of America (TWU), International Union of Bricklayers and Allied Craftworkers (BAC), International Longshoremen’s Association (ILA), International Union of Elevator Constructors (IUEC), International Union of Allied Novelty and Production Workers, Professional Aviation Safety Specialists (PASS), National Air Traffic Controllers Association (NATCA), Seafarers International Union of North America (SIU), Operative Plasterers’ and Cement Masons’ International Association (OPCMIA), IATSE, International Association of Bridge, Structural, Ornamental and Reinforcing Iron Workers, United Mine Workers of America (UMWA), Glass, Molders, Pottery, Plastics, and Allied Workers International Union (GMP), United Association of Journeyman and Apprentices of the Plumbing and Pipe Fitting Industry of the United States and Canada (UA), International Plate Printers, Die Stampers, and Engravers Union of North America, International Longshore and Warehouse Union (ILWU), Transportation Communications International Union/IAM (TCU/IAM), United Steel, Paper and Forestry, Rubber Manufacturing, Energy, Allied Industrial & Service Workers International Union (USW), International Union of Police Association (IUPA), United Union of Roofers, Waterproofers, and Allied Workers, United Transportation Union (UTU), and Utility Workers Union of America (UWUA). Job injuries can change our life within an instant. We believe in being there for all workers who have been hurt on the job. We have earned the trust of many unions and labor organizations. 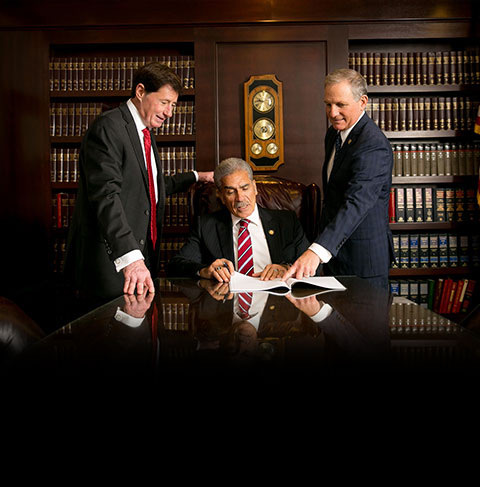 We will be sure to use our experience to ensure you are well taken care of throughout the legal process. All initial case consultations and evaluations are free. You will meet an attorney who will listen to you. Unless and until we do our job and win your case, you will not incur any legal fees or costs for our time and assistance. We are ready and available to meet at our office, your home or hospital room Monday – Friday 8:30am to 5:30pm. If you prefer evenings or weekends, we are also available then by appointment. We can come to you. We are well known throughout San Diego, California, Long Beach, Orange County, Riverside, San Bernardino, Los Angeles, San Jose, Sacramento, and the San Francisco Bay Area as hard working and ethical workers’ compensation attorneys.